Nurses around the U.S. are now being forced, coerced, or threatened with termination of employment if they do not comply with vaccination requirements when working at a hospital. 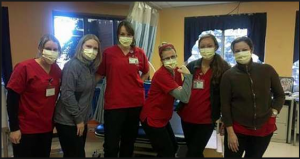 Well, some may say it is their duty to be vaccinated to protect the patients…but is the flu vaccine actually protecting patients and helping the hospital staff stay healthy? Is forced flu vaccination policies based on science or what does the scientific research really say about this subject? Learn more and let this video point out what is really going on when it comes to hospitals forcing nurses and other staff members to take the flu shot. I’ll give you a hint: It’s not the patients they are worried about losing–it’s the profits. Promoting to Everyone Focusing on No One – The Illogical Promotion of the Influenza Vaccine. Effectiveness of school-based influenza vaccination. ← Is the CDC Insane?